The path of the righteous man is beset on all sides by the inequities of the selfish, and the tyranny of evil men. Blessed is James Lipton, for he is truly his brother's keeper, and the finder of lost children. 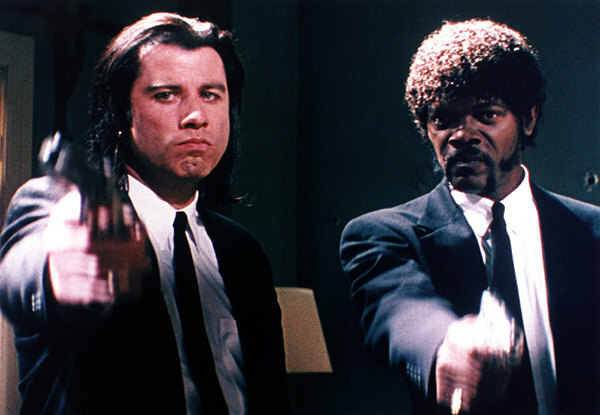 And I will strike down upon thee with great vengeance and furious anger, those who would attempt to poison Samuel L Jackson, in this one hour interview made in 2002. Amen. Now who's the coolest cat in the class? Is it the man in the hat, Samuel L Jackson? Or the man with the beard, James Lipton? Nah! Not saying. But what I will say is that James starts off this staged interview by asking Sam the following questions: (1) About his upbringing and his time in academia. (2) What his relationship was like with his estranged father. (3) How television and movies influenced his views on life. (4) What where the circumstances surrounding his Aunt Edna encouraging him to first perform on stage. I had an all-black education, but it was still pretty full. We called 'The Black Image Company' the 'We hate white-y theatre group', ha! I liked being the big fish in the small pond; it was my wife's idea to move to New York City. Spike Lee won't say a lot -- on or off the set. I got a job I love; and I want everybody around me to be as happy as I am. I took so many drugs, I didn't know what the f*ck I was doing. I like who I am. Greed was a factor. But I still had the strength within me to come out the other side. Acting is like performing the perfect golf swing -- the less you think about it, the better the result. I can't wait to see what I'm fighting in Star Wars. Ha! I beat Tiger Woods at golf. First time. On 'Do the Right Thing' -- My character was the conscious of the community. On 'Jungle Fever' -- I played a drug dearer. I did a lot of research for that role, ha! On 'Pulp Fiction' -- Quentin would describe a scene using many other films as references. He's Mister Enthusiastic. On 'Jackie Brown' -- I like all of my characters to look very different. I designed Ordell's beard myself. On 'Time to Kill' -- I based my character on the story. On 'The Negotiator' -- My character was a very logical person, yet was still a ticking time bomb ready to explode. On 'Changing Lanes' -- I was Doyle. There's a time in everybody's life when they question what they are doing. On 'Star Wars Episode 2: The Attack of The Clones' -- If I tell you anything about it, I guarantee you I won't be in episode three. Now in closing this show, Sam answers questions posed by James from the Bernard Pivot structured questionnaire; where we learn that he likes the word 'Mother f*cker', and hates the word 'No'. After that, he then answer's subsequent questions posed by the studious audience, about: acing with his wife as his wife, regaining his strength after a painful loss, and merchandising. Honest. Real. Inspirational. And a men amongst men. That's the impression I got from Samuel L Jackson after watching him in this episode of 'Inside the Actors Studio'. I mean -- Wow -- what a great guy he really is! All of his answers were real honest and full of fun. And never did I hear him once pontificate or boast about what he's did or why he did it. To me, Sam is just the epitome of the American Dream come to life. The false-start. The period of adjustment. The fanning of hope. Plus the fledgling wish which one day became a reality. Well, lets' face the facts. Sam battled his way through a turbulent childhood, a heavy drug addiction, and any racial snafus that came his way, and became a super-star that any man would love to be. Yeah. Even me. Your ever loving pale-skinned reviewer. I would love to swap places with this Nubian legend in a heart-beat. I could imagine it now -- sitting in a diner -- hat on backwards -- and reciting his bible-slanted monologue from 'Pulp Fiction'. Granted, I'd most probably insert a Python reference for good measure. But that's OK. Yeah. Sam would approve. Because he knows that acting is all about good instincts and communal memory, both feeding off of each other in a very personable way. Not once in this interview with James did he state 'that was wrong' or 'that was right'. Sam knows that knowing who you really are is the key to performing and drama. Moreover, Sam's very charming warm to boot; and I just loved how he said it 'like it is', without adding any airs or graces into the proceedings. Sam is the man. And he will always be the man. No matter what the f*ck I say in this prose-piece of b*llshit. Say no more.